The Koppers/Beazer East property was the site of a chemical wood treatment plant from 1916 until 2010. Initially, telegraph poles and railroad ties were soaked in trenches filled with creosote, a highly carcinogenic coal tar derivative. Eventually, telegraph poles were replaced by telephone poles, and creosote was replaced by an even more deadly chemical cocktail: chromated copper arsenate, known as CCA, which was sprayed onto the the wood. Teratogenic and mutagenic as well as carcinogenic, CCA is now officially recognized as a major danger to public health by the US federal government. Poor waste handling practices over nearly a century of operation have resulted in contaminated water, soil and air. The extent of offsite pollution has never been delineated. Florida DEP granted permits to Koppers that allowed the polluter to legally discharge storm water into our creek systems, contaminating private properties along the way to the Haile Sink, which directly feeds into the Floridan Aquifer, the source of our drinking water. is there a way to test my home for the dioxins? Yes, but this testing must be conducted and evaluated by an EPA-approved lab using EPA protocol and is very expensive. if you like, you can contact the Superfund Site Class coordinator Stephen Murakami for more detailed information. His contact details are on our April 2012 postings page. 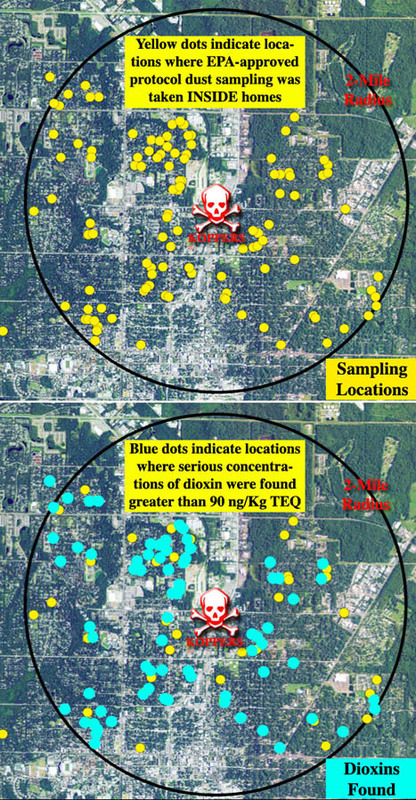 Is there a map available with the data regarding dioxin levels in the soil for a 2 mile radious? If so, please send this to me. Please contact the class action liaison regarding scientific data. Mr. Murakami’s contact information is on the April 27, 2012 posting. I recently signed a lease to rent a property located right off 6th st. Right Past 23rd. It was never disclosed to me that is was located In a superfund area. Someone told me it was and that I need to be careful with my dog playing in the soil. I am furious and do not want to move in unless someone can test the soil there and confirm its not polluted at high levels. Who can I contact to find out about if the rental property is polluted or is the yard going to be torn up? I have been told the top soil might be removed. I wish I would have know about superfund before I signed this lease! Any advice ? Your landlord is legally obligated to disclose: Florida law requires full disclosure when selling and renting out properties near superfund sites because of the severe health hazard presented by toxic exposure. Undisclosed-to tenants near Koppers who have complained publicly at City Commission meetings have subsequently been released from their leases by their landlords. Also be aware that residents who had their homes independently tested found out that the levels of dioxins, arsenic and PAHs are hundreds of times higher inside of their homes than in the soil outside in their yards. Gainesville Commission meetings are held every other Thursday (call 334-5015 for details). Alachua County Commission meetings are held every other Tuesday (call 374-3636 for details). Thanks for your feedback luckily I did get out of the lease and got my deposit back! Is there any testing done further than the 2 mile radius? I’m talking more like 5 miles away or more from the site of contamination? Also, are the elementary schools in that area contaminated? Independent testing was performed up to two and a half miles looking for the contamination drop off point, but no drop off point was found. The Alachua County Schoolboard has ignored parents’ requests for indoor testing of schools within two miles of Koppers. Schools in other Koppers Superfund towns such as Somerville, Texas were tested and found to be dioxin-contaminated. Watch what you drink. If you didn’t already know. The EPA have been testing the contaminants in the Hawthorne spring / Smaller Hawthorne aquifer for at least 5 years that I personally now know of. They have many testing wells all around the Koppers/Cabbotts sights in the property’s of local businesses. I cant’ tell you what they have found, but what I can tell you is that they are now back drilling new test well-sites and this time they are going all the way down to the Main Florida Aquifer not just the upper Hawthorne where the County and City draw our water from.. It is my opinion that The USEPA do not like to PAY for projects unless there is a REAL concern for the safety of a community. Unfortunately we only find out after the damage has been done. 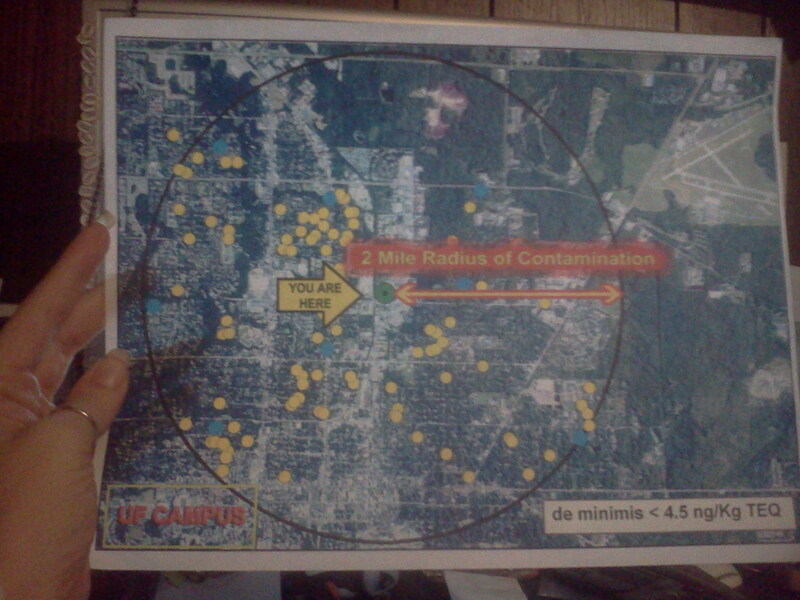 The 2 mile radius includes portions of the University, has UF been tested for toxins all around the campus? Do you know what their stand is in all of this situation? Has there been any documented complaints made by students or university staff? To the best of our knowledge, UF has not agreed to any on-campus testing for Koppers contaminants. Interdisciplinary graduate student groups that wanted to design and conduct in-depth health studies for Gainesville Superfund area residents were denied permission to do so by their faculty directors. UF students and alumni living in Stephen Foster Neighborhood have shared their health complaints at city commission meetings.